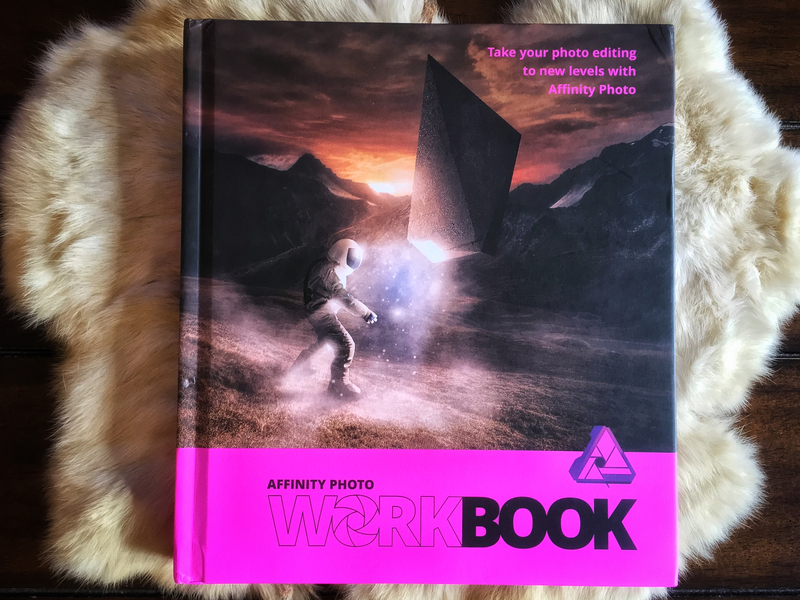 We are proud to announce the launch of the official Affinity Photo Workbook, our first ever guide to Affinity Photo on macOS and Windows. Painstakingly put together over many months, the long-awaited Workbook teaches you everything there is to know about Affinity Photo and mastering its powerful tools and capabilities. .
You can find more information about it here. Usual price is $49.99 / £37.99 (+ shipping and handling). It's available in English and German. Received my copy and really pleased. Will take me a while to go through all the lessons but will certainly improve my skill with Affinity. Quality production and excellent for long term reference. I tried to purchase both designer and photo books but the website only allows me to purchase them individually and pay double postage, is there any way around this. It would be better to get both at the same time instead of two separate transactions. Just got the e-mail this morning and ordered my workbook. It looks impressive and (maybe) more than I was asking for, but this is great! I like AP, but not living on it every day has made it a bit frustrating to do more than basic things. I am hoping this will change that and open new doors for me. Thanks for finally coming through with this book. Welcome to the Serif forums. We do not have a basket system, only a single item ordering system. Consequently, we do not have any offers on delivery for both books (or multiple books). The delivery costs are those charged by our delivery partner, who takes the orders individually, so we have no mechanism to send the books in the same parcel and save costs. However if you call us or email affinityorders@serif.com explaining what you want we have offered 50% off the postage of the second book, and we absorb the difference ourselves. I would say you might want to do this quickly as the 25% offer on the workbook prices only lasts till Monday 4th. No-brainer purchase! Can't wait to get mine! Glad that both Designer and Photo are QUALITY, hardcover books - also nice to have great, readable offline, documentation for my favorite software! PS - I'm still waiting for an "Affinity PagePlus" replacement for my beloved PagePlus program!.. Just got my copy of the Affinity Workbook and I'm a little confused. How do I download the resources from the https://affin.co site ? It needs a Login and I don't have a password ? Anyhelp would be welcome as I cannot find the answer on the Affinity website. So, in your browser URL bar (not into google or any other search engine) type in the link exactly as they appear on pages 8, 86, 140, 156, 174, 188, 200, 226, 248, etc, you will get a zip file to download, one for each hyperlink on each of those pages and the others later in the book. So for example the one on page 86 says https://affin.co/photocoreskills (or in the German book https://affin.co/photocoreskillsde) which should download photo_core_skills.zip into your downloads location. Inside that zip file you will find all the files mentioned in that chapter in the purple boxes on pages 87, 90, 94, 98, 104, 114, 120, 130 & 134, and referred to in the text again in purple. Extract the zip file and follow the tutorials using them. just received mine in the mail, pretty fast shipping! I got my book earlier this week. Like the Designer book this is an excellent value. Not just in physical quality, but in content too. Here's why. First, you learn the basics of the app and where things are. Next, you start on projects that teach you new things and often build on skills you learned in a previous one. This progression causes you to build knowledge and confidence at the same time. I've had more than a few "Aha!" moments. Not just about the app, but about the techniques they are teaching. I've also found inspiration and plan to try some new things. Brief project overviews are provided too. So you know what gear was used, what the photographer was thinking and planning etc. So it's more than turn page... click here ... do this... TADA! Full disclosure before I hit submit. Affinity Photo had been collecting dust on my HDD for a while. I bought it thinking, like Designer, it would be a great creative alternative to Adobe. But I quickly got frustrated with the UI. I was hopeful this book would change that and so far it has. And... I'm only half-way through it. Let the good times and learning continue. Got mine yesterday. Looks like a well thought out informative book. I’m glad I ordered this and am looking forward to following along and learning even more! I think book is great, but I have one question. Some months ago I bought Affinity Designer Workbook and pay about 20 PLN for shipping to Poland. It's regular, not lowest, not highest price for delivery. Book is great. Now, I want to buy yours great Affinity Photo Workbook, I put it into basket and found that shipping will cost about 80 PLN, when book is priced at about 140 PLN. More than half price for delivery? 4 times more then previous order shipping cost (to Poland)? Why? 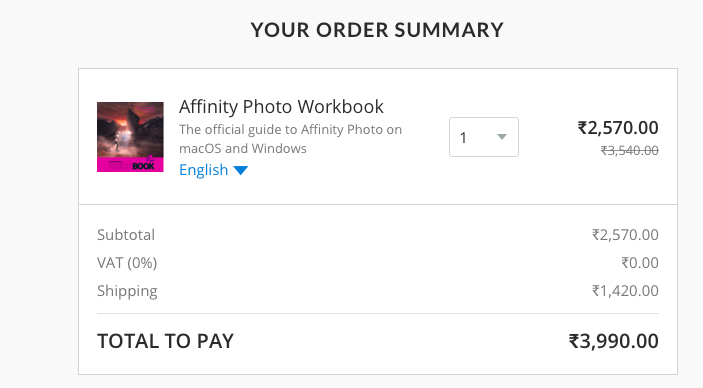 I'm trying to buy the Affinity Photo Workbook on the Affinity website but the discounted price is not showing as being available even though my email from Affinity says it was extended to Dec. 4. How do I buy at the discounted price? The Affinity Store is still showing the discount price for all regions. I'm guessing, but perhaps you saw a discount price quoted in US$ and are now seeing the store presenting in AU$ or CA$, still discounted but looking like it's more. We had a bug in the store code that made it possible to get the wrong delivery price for the Affinity Designer Workbook. This affected about 2% of orders placed. The delivery of that book cost us the full 80 PLN but we did not charge those orders the full delivery charges. The Affinity Store does now charge the correct amount for delivery of the Workbooks. These charges are passed directly on from our delivery partner, as described further up this thread. I would like to buy the book but the delivery charge is 60% of the book price !! is there any Delivery issue in Europe ? I've started working my way through the book. I'm the sort who likes a structured learning environment and this is quite good at that. I've learned quite a bit by just reading about the user Interface even though I consider myself quite experienced when it comes to figuring out a UI. Highly recommended. This was the problem; the price quote was in Canadian dollars, not US. Once I completed the order info with my address it changed to the correct amount. Order just placed & have been looking forward to something like this ever since I was a beta tester for the original release. I cannot say if yours is affected but yes, some orders have been delayed by stock replenishment problems at our despatch partners. If you email AffinityOrders@serif.com with your order number they should be able to be more specific. We are hoping that all delayed orders can be cleared early this week, but it depends on a few factors that we are trying hard to resolve, sorry for the delay. True, and considering that 'Amazon delivery' are our partners it's a lot that they charge us for the warehousing and delivery part. Perhaps that's why they are a multi-billion dollar company. I understand that these delivery costs look high, but combined with the reduced price book we may still be cheaper than ordering from Amazon directly. Please check as Amazon.de sales are not Serif sales so best to choose what is right for you.